Travis county, Loop 360 to Zilker Park section whitewater kayaking, rafting, and paddling information. be a class III section. Whitewater rafting and kayaking in this state is often easier than elsewhere, so don't forget that quite a few of the sections in this state are pretty easy. You might be into whitewater rafting or kayaking or both, doesn't matter, there are lots of good spots for that around here. The campgrounds here at Barton Creek are pretty good. The put-in is not too far from Austin-Round Rock, if you're not familiar with the area there's a road map further down the page. This is a pretty decent length section, it's perfect for a one day trip. A good workout and just hanging out with mother nature are great reasons to come. 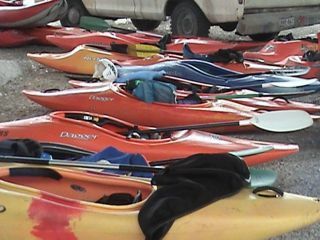 These outdoors activities are available near Barton Creek.